Here are some tips and ideas to consider when determining the types of attic storage solutions to employ in your home, which keep in mind both practical and safety concerns with storing items in this area. Attics are a great place for storing certain types of items in your home that you don't need to access too often. What all of these examples have in common is that they are items that don't have to be accessed too often within the year, and that once they're retrieved, do not need to be put back into storage for a while. 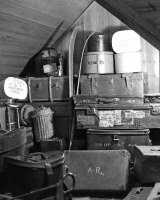 The reasons the items stored in your attic should meet these criteria are because attics are typically not very accessible, can be dangerous places if you're not careful and don't prepare them well, and aren't normally conducive to fetching things up and down, back and forth, easily and quickly. However, you can employ certain attic storage solutions to make it as easy as possible for you to use this storage space to its fullest. 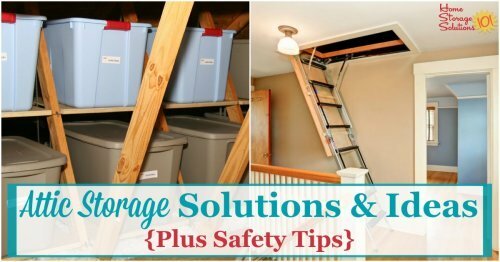 Below I've shared some of the best solutions available, to help you make your attic accessible, and safe, and to maximize the amount of storage space it can provide you. Often, attics are accessed through ladders, and/or you have to stoop low once you are in the attic to move around. The harder the items in your attic are to access the less things you should store in the space. You should certainly not store things there that you need access to more than twice a year. If you decide to store things in a hard to reach attic space, just realize that psychologically, you've created a barrier toward accessing the stuff in the first place, or just as importantly, gathering the energy to put it away again once you're finished with it. Therefore, make it as easy as possible to get into your attic as you can. Many people are afraid of the stairs and/or ladder leading up into the attic. Adding a handrail, for instance, such as the one shown above, to the right, can help you feel safer as you climb up and down from this storage area. That is a prime example of making your attic more accessible. 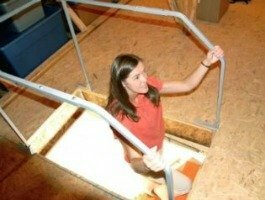 The issues of accessibility and safety really go hand in hand when it comes to attic storage. That is because many attics can be dangerous places. They are often unfinished, with floors that are not sturdy, or no floor at all, just beams, or there may be roofing nails sticking out of the roof ceiling. I'm such a stickler for attic safety because my father was seriously injured in our attic, when he stepped down and missed the beam and partially fell through the ceiling of our garage. He broke his leg so badly he needed surgery and he had to walk with a walker for several months. 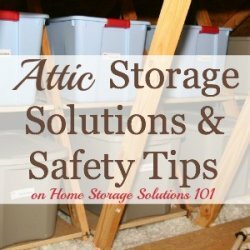 You may need to address safety issues in your attic before making it a storage area, so look critically at your space to identify any safety issues you may have. One of the most common such safety issues, which also becomes an issue of accessibility, is the floor in the attic, or lack thereof. You may, for example, need to lay plywood, or another surface such as Attic Dek flooring which is shown above, to the left, to make the floor more stable and secure. 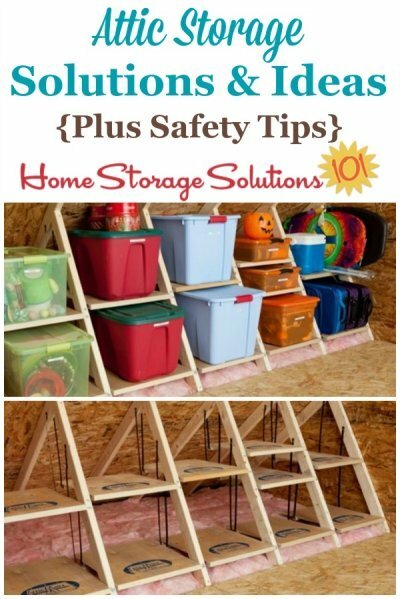 This keeps the floor safer for you or a loved one who is gettig things out of or putting things into attic storage, and also makes it possible for you to store more items in this space at the same time. Even if you've made your attic safe for storage, and also feel it is accessible enough, the last thing you should consider is the storage environment. Even though they're typically dry the items stored there are exposed to temperature extremes, with it being very hot in the summer and very cold in the winter in the space. Not everything will do well stored in such an area. Therefore, seriously think about this issue before you store anything there which should stay in a climate controlled environment, because certainly the attic is not one. Once you've identified the best items from your home to store within this space, try to make the most of the attic storage area by using some additional storage solutions. A great example of making the most of this space are the attic truss shelves which are shown above. These shelves allow you to easily stack more storage containers into the area, while allowing you to grab a container from the bottom of the stack without having to unstack everything on top of it. This can be very handy in a hard to maneuver around in area like your attic, where you don't want to have to move items around more than necessary. 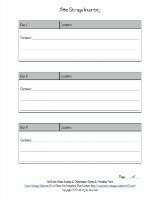 Here are some additional articles and resources on this site which you may find useful in getting your attic in tip top shape.